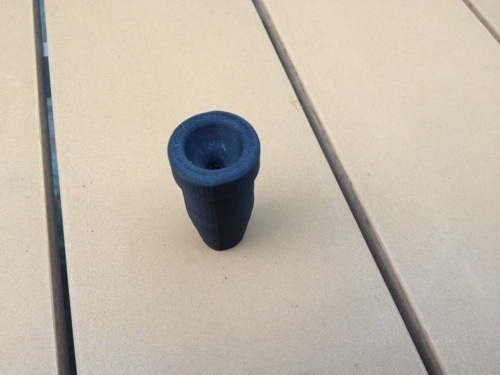 Here’s the second-generation prototype of a soprano sax / trumpet mouthpiece hybrid. 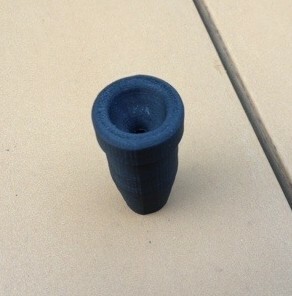 This was printed on a Makerbot Replicator 2X. I modeled the soprano sax mouthpiece base and appended the geometry of a Bach 1-1/2C trumpet mouthpiece found on Thingiverse. The trumpet cup is a bit roomier than the previous prototype; I think I’ll try a trombone-sized cup next. Here’s the STL file so you can download, modify and print your own. This entry was posted in Hardware, Music, Photo and tagged 3D printer, Bach, Makerbot, mouthpiece, soprano sax, trumpet by Holland Hopson. Bookmark the permalink.